Rows between rival electoral commissioners had led to physical fights, Jecha Salim Jecha said. The elections in Tanzania are the most competitive in the country's history, with four opposition parties forming the Ukawa coalition to challenge the ruling CCM's 54-year grip on power. Mr Lowassa urged his supporters to remain calm and not to engage in street protests. In his statement, Mr Jecha accused Zanzibari electoral commissioners of being partisan. More votes had been cast in some areas than the registered number of voters, especially in Pemba, where some party agents had been ejected from polling stations, Mr Jecha said. The ballot papers for the national presidential election have been taken to Tanzania's main city Dar es Salaam, where they will continue to be counted. 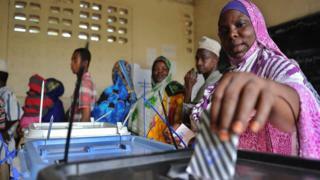 It is unclear if and when new elections for Zanzibar's president and parliament will be held. Never before has an election in Zanzibar - a popular tourist destination - been scrapped. So we are entering uncharted waters. And yet, this election - unlike previous ones - has not been marred by riots and violence. There was, however, some tension, which led to the closure of roads and businesses. On Monday, the main opposition candidate for the post of Zanzibar president, Maalim Seif Sharrif Hamad, declared himself the winner. His announcement attracted sharp rebuke from the governing CCM party, which called it illegal and a threat to the archipelago's stability. But life was returning to normal when the archipelago's electoral commission chairman made the shock announcement that he was scrapping the poll because it was full of gross irregularities. At that point results from 36 of the 54 constituencies had been released. CCM was formed in 1977 from a merger of two post-colonial parties and has effectively been in power since independence in 1961. It has fielded Works Minister John Magufuli, 55, as its presidential candidate. He is being challenged by Edward Lowassa, 62, who quit CCM after he failed to win its presidential nomination. He is contesting the poll under the banner of the Ukawa coalition.